Made by heating powdered limestone with clay, cement is one of the most important materials in the civil engineering and construction industries. It is one of the substances used for creating concrete which is subsequently used for building foundations, plastering as well as numerous other purposes. However, despite its benefits, keeping cement build up, waste and spillages at bay can be a tricky task. 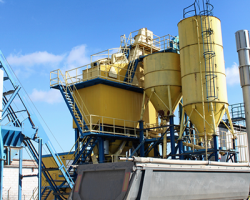 It’s reported that up to 10% of production output within a cement plant is found as spillage. It’s therefore no surprise that cement production poses a constant challenge to plant engineers and planners, with a potential for business production rates to suffer as a consequence. Solving these issues was our main goal when Primasonics was originally founded in 1987. And twenty years on, we continue to excel in solving many process and storage and build up problems within plant Boilers, ID Fans, Filters, ESPs - as well as blockage and flow issues in bins, silos, hoppers and mixers. 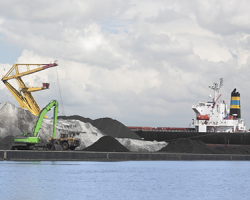 What other difficulties do cement plants face? As previously mentioned, one of the main difficulties within the cement industry is keeping spillages under control. Indeed some of Primasonics’ most challenging, but successful, applications were within silos which contained dry materials such as cement. When appliances are not cleaned and maintained properly, particulate build significantly reduces their efficiency and can place an additional dust loading onto the electrostatic precipitators or filters. Ratholing – where the material builds up on the sidewalls causing severely reduced “funnel flow”, which also restricts the silo being used to its full storage capacity. Bridging – where the material bridges over the outlet area either severely restricting flow or stopping it completely. Cross contamination between product batches has long been seen as a serious problem within cement plants, leading to unwanted effects. Blend Uniformity - As for all materials, the performance of concrete is determined by its microstructure. Its microstructure is determined by its composition, its curing conditions, and also by the mixing method and mixer conditions used to process the concrete. Ultimately, the quality of the concrete produced determines its performance after placement. 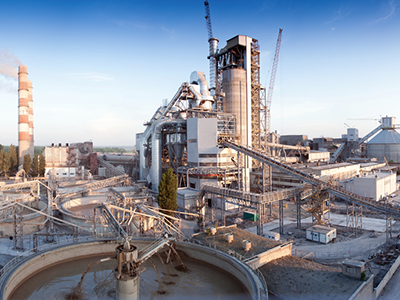 How can acoustic cleaners benefit your cement plant? It’s no secret that, for a company to have a competitive advantage in the cement industry, it needs to make its assets and processes as productive as possible. 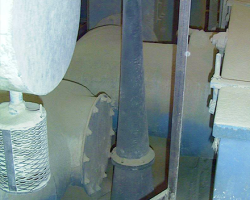 Our world leading acoustic cleaners could help your cement plant by not only cleaning the processing units in the most cost effective and low-risk way, but also by maintaining the correct airflow within them. Unlike air cannons, an acoustic cleaner prevents the occurrence of build ups and continually aids thick bed material flow. It also eliminates the need for large volume of air produced by air cannons and therefore does not disturb the overall operation of a cement plant. What’s more? We’re the only company that can produce a six-frequency range of Acoustic Cleaners in ten different styles, manufactured by spinning 316 grade stainless steel (the Prima Range). We’ve also developed a new range of sonic soot blowers (the Quattro Range) which has the same top performance as the Prima range but is more economical to manufacture. Higher frequency models can be installed at the discharge of smaller cement silos to prevent material bridging and facilitate maximum flow rate. Calciners: Acoustic cleaners can aid hot air flow through the range of modern calciners and prevent material bridging in both the unit itself and ductwork. 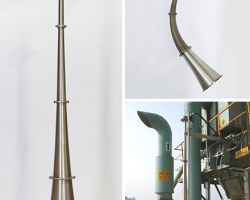 Dynamic Cyclones: These can be prone to impeller blockage and damage which in turn can lead to cyclone blockages and prevent efficient upstream equipment operation. Acoustic cleaners maintain correct airflow and efficient solids separation by eliminating particulate build up. 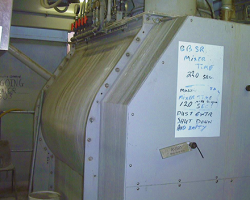 Mechanical Pre Collectors: Particulate build up in these units significantly reduces their efficiency and can place additional dust loading onto the electrostatic precipitator or filter. Acoustic cleaners can prevent particulate build up around the impellers and between tubes, thus ensuring that they always operate to maximum efficiency. 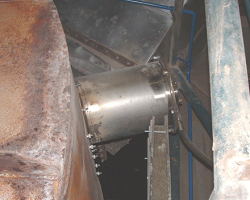 Mills: Acoustic cleaners can maintain material flow and prevent blockages in the pre-grind silos. They can also be highly effective in preventing material build up in the downstream separators and fans. The positive end result is to provide even, consistent material flow, which results in consistent quality. 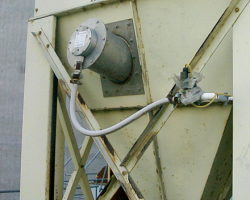 Planetary Coolers: Those kiln systems, which still retain this type of cooler, would benefit from the installation of acoustic cleaners to prevent bridging and ensure complete evacuation. Static Cyclones: Acoustic cleaners prevent blockages and prevent material build up both within the cyclone and the associated ductwork, thus ensuring constant air flow and maximum particulate removal. These are some of the process areas where Primasonics acoustic cleaners have successfully been employed within the cement industry. The list is not exhaustive, indeed should any facility incorporate a power generation plant then remember that Primasonics acoustic cleaners have also been successfully employed in boilers, superheaters, economizers and air heaters.